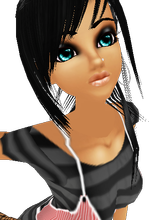 The EckoRedGirl Models of IMVU and their fans. This will be the new home of ERG Models rather then the IMVU Group page. I'm Preciiouse, also known as Esh. 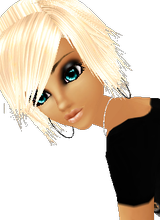 Since I have joined ERG, modelling has become one of the main things I do on IMVU. I won an award for the preppiest model on ERG. That really stood out for me. Winning an award for the style I like best! My style is mostly preppy, I love girly clothes, yet my wardrobe also has sophisticated pieced too. I have anything from crazy glasses to little black dresses. I believe I can carry of many looks, but a young, fresh, preppy look is what I believe I do best. I edit images as well. I believe this goes towards my advantage as I can help the developer edit the product images. Thank you, and I hope you have a wonderful day! Esh has actually modeled for my products. She works very quickly, efficiently and has a professional attitude during the process. She knows which poses to use to show off the items she is modeling and I found her to be a pure pleasure to work with. The finished image has not been completed as of today as I am still editing but I will gladly link the modeled image as soon as it has been uploaded. I highly recommend this model for developers looking for a young, fresh, experienced model for their products. I think she looks amazing in the girl next door style clothing and accessories. I wanted to also comment on your portfolio here. I love the fact you mentioned your award. That was a big deal and I think it will show devs that you have accomplished something big even if you have not modeled for a million devs like some others. It makes you stand out. This portfolio page is great. Please add some full body shots as well as I feel devs would appreciate seeingsome without needing to link elsewhere. Thank you so much for your reference Bebe, That means so much to me you cannot imagine. I'm so glad you like my portfolio and i shall work on those full body shoots a.s.a.p. » 17 year old Flanker, CSR 39,208, U20 Prospect, Superb natural stats. » Spring?? Its here early this year!! !